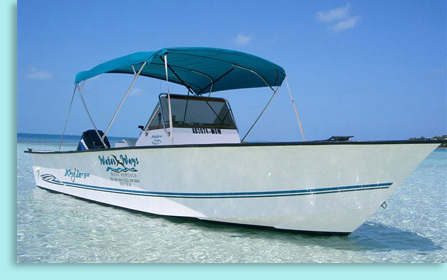 Family owned and operated since 2000, Water Ways Boat offers complimentary pick up from our neighboring Islands, Elbow Cay, Marsh Harbour on Great Abaco, Guana Cay and Lubbers Quarters . Our boats are clean, mechanically maintained, and ready to take you on an enjoyable, fun filled excursion through our chain of beautiful islands. Our boats are easy to handle and our waters free of obstacles, after a thorough boat and chart check out, even a novice boater will feel comfortable enjoying a safe and memorable day on the water. Come to the Abaco's and spend your day exploring our pristine beaches and crystal clear turquoise waters. Known for having some of the most beautiful beaches in the world, here there are more than you could ever visit in one stay, with dozens easily in reach for day trips. Visit our quaint settlements and meet some of the friendliest people anywhere, here you can swim, snorkel, fish, take a leisurely walk collecting shells, or simply sit on a deserted beach enjoying that book you've always wanted to read. Enjoy our web site, and please don't hesitate to contact us for any additional information.